Snorkeling in Aruba is a must, whether you are there for an extended stay or just for the day during a Caribbean cruise, as we were. One of the most striking features of Aruba's waters is its high visibility. With 60 to 100 feet clear views you'll get plenty of fish to look at! 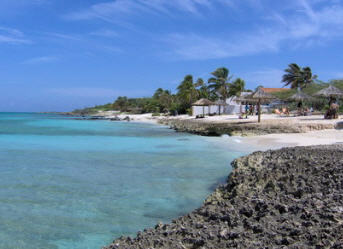 We chose Boca Catalina beach for our Aruba snorkeling experience. Nestled between Arashi and Malmok along the Northwest coast, Boca Catalina is mostly for snorkeling. There is just a small area to walk in the water, the rest is a rocky beach with a few palapas, no chairs, no facilities and a little layer of sand. Snorkeling at Boca Catalina is great. Especially for beginners, as you can see fish not far from the beach. For more experienced snorkelers, go off to the right, away from the beach a bit where you see dark in the water. We were amazed by the variety and the sheer amount of tropical fish in the crystal clear water. Unless you've rented a car, the cheapest way to get to Boca Catalina beach is by bus. The bus stop is right across the main street in Oranjestad. Take the bus to Arashi. Round trip costs US$2 per person. Buses leave about every hour. As they stop at hotels along the way, it takes about 20 minutes to get to Boca Catalina. We didn't want to wait for the next bus, so we took a taxi. It cost us US$18 and took only 10 minutes. To make your Aruba snorkeling a pleasant experience, you should bring sunblock and a long-sleeved shirt (like the ones surfers wear). As you'll swim close to the water's surface, you are extremely exposed to the sun. Many Aruba vacation package deals include snorkeling gear, as do shore excursions booked on your cruise ship. If you explore Aruba on your own, you can easily rent snorkeling equipment at one of the local shops. Personally, I prefer bringing my own mask. Rented ones never seem to fit my face, and I hate salt water up my nose! Of course, Aruba isn't the only place to snorkel in the Caribbean. During our cruise with the Princess cruise line we had the chance to snorkel on Princess Caye and on Klein Bonaire.